Duras is a small town in the north-east corner of the Lot-et-Garonne department of Aquitaine (south-west France), best known for its castle and wines. A pleasant town, if rather quiet, Duras has one main sight that attracts visitors: the Chateau de Duras. There is also a medieval clocktower, and a sprinkling of attractive houses to enjoy while exploring, and the impressive Maison des Vins commemorating the highly regarded wines of the region. You can start your visit right in the town centre with a look at the clocktower. This building was originally part of the 12th century ramparts that once defended the town. Apparently there were originally four of these imposing gateways but now only one remains. Note that the clock and the steep Perigourdine style roof were added to the tower much later, in the 17th century. 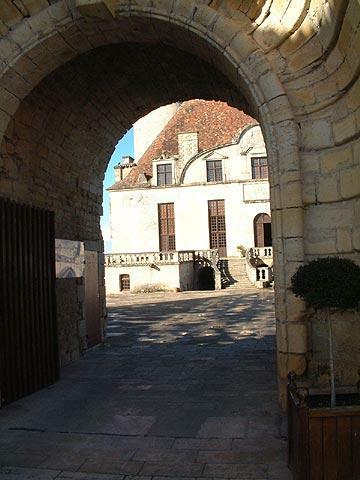 The chateau (and the grand entranceway that precedes it) are just below the main square. 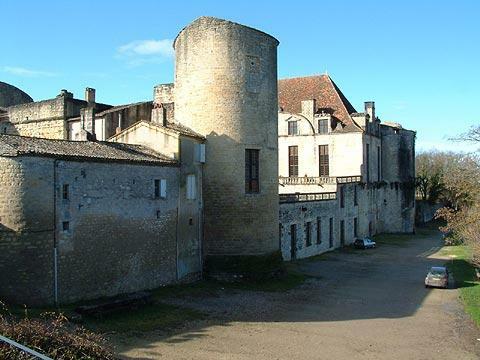 Originally built in th 12th century, the chateau de Duras was fortified in the early 14th century, then subsequently transformed in the 17th century into accommodation more suited to residential use, with many luxurious touches being added in the process. As with many French castles it suffered important damage at the time of the revolution, but the second half of the 20th century has seen the castle substantially renovated. Your visit to the castle leads you through a large number of imposing rooms and through the attractive two storied balconied interior courtyard. You also see the original bakery in the castle, the kitchen and a room with some extraordinary carpentry work (a recent but faithful reconstruction of the original), before visiting the tower and views across the valley below (there are quite a lot of steps to go up the round tower). Duras is also, of course, well known for its wines and no visit would be complete without taking a couple of bottles home with you. Much the best place to start your researches is the Maison des Vins in Duras itself which stocks a very large range of local wine and also features an exhibition about the local wine industry, and an interesting garden where you can see various vines and learn about the differences between them. There are also a good selection of restaurants in the town where you can enjoy a meal accompanied by one of the local Duras wines. The renowned 20th century author, Marguerite Duras wrote her first book here (her family were from Duras) and took her name from the town (her real surname was Donnadieu). 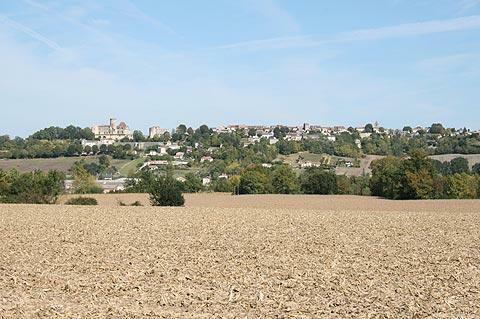 The countryside around Duras contains various small villages with ancient churches and castles. Among the most interesting are the small village of Monteton to the south-east of Duras which has a 17th century castle and a large roman style church and is surrounded by fruit orchards; the 17th century Château de Théobon at Loubes-Bernac; and the small churches at Esclottes and Sainte-Colombe-de-Duras. France This Way comment: my partner is a keen gardener and tells me I have to recommend that you visit the Jardin de Boisonna at Baleyssagues (open mid-April to end September) just outside Duras because it is one of the nicest gardens in the region! At Allemans-du-Dropt you can take a stroll around the village then look at the very impressive frescoes in the church, while a little further east you will want to visit the medieval town at Eymet, one of the best preserved bastide towns in the region. A seasonal market is held in Duras on Thursday.